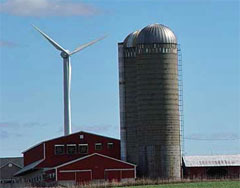 Alternative energy advocates say proposed legislation could unleash more wind energy in Wisconsin. Ryan Schryver with the environmental group Clean Wisconsin says while major wind farm proposals of one hundred megawatts or more go through the state Public Service Commission, smaller projects face a daunting patchwork of local regulations, and often a "not in my backyard" attitude. "Right now, individuals who decide that they oppose wind farms – usually because they decide they don&apos;t the way these things are going to look – are able to rewrite local and county ordinances, specifically to eliminate the potential to do wind projects in that area," says Schryver. Schryver says these local ordinance moves have delayed, and in come cases outright blocked, construction of around 600 megawatts of Wisconsin wind power. He says the proposed legislation will address that. "It requires the Public Service Commission to pull together a stakeholder committee of energy experts to establish what those local standards should be, and create some statewide standards to be implemented by the local units of government in the future," explains Schryver. Schryver says small to medium sized wind farms would be defined as those with fifty or fewer wind turbines. The bill does not address the issue of defining "setback," or how far from adjacent property owners the turbines would have to be placed. "This legislation does not get into the specifics of how far a turbine should be away from a local landowner," says Schryver. "That will be up the Public Service Commission and that stakeholder group of experts to determine."